Finding the perfect accommodation according to your requirements is a tough task. You will have to pay a lot of brokerage and waste your time & money in the house hunting process. Never mind, because now you have Studentacco by your side to help you acquire homelike PG accommodation. If you are seeking boys & girls PG in Kalkaji, then the range starts from Rs. 4000 to Rs. 15000 inclusive of all the basic facilities like kitchen, attached toilet, furniture-bed-chair-table, fair supply of electricity and water etc. The rooms of the PG are spacious and viable enough for anyone to make their living worthwhile. It is also open to shareable occupancy, which is extendable to three people. There will be no commuting issues because metro, auto, bus stands are located in its nearest proximity. For household and personal requirements, you have grocery stores, shopping complex, salon, spa, doctor etc available near the PG accommodation. 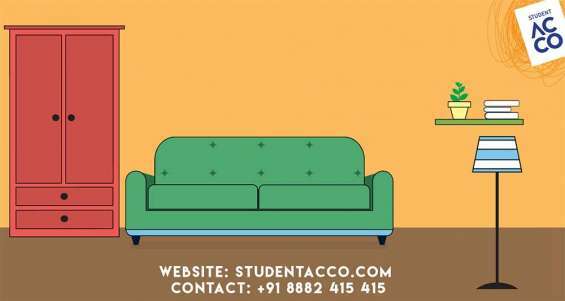 So, if you are looking for a homelike comfortable accommodation, then go to our website www.studentacco.com.